Stay at this Clewiston, Florida hotel located on the southwest shore of Lake Okeechobee and offering personalized service to each guest. The Best Western of Clewiston is set in America's sweetest town at the heart of Florida's sugar industry. The hotel is near beautiful waterways which connect Lake Okeechobee to both the Atlantic Ocean and the Gulf of Mexico. Hotel guests will appreciate the variety of shopping, golfing and dining nearby. Guests will also be close to the fishing pier with boat and jet ski rentals. Each well-appointed room features free high-speed Internet access, free long distance access and all the standard amenities and services. Other hotel amenities include a heated outdoor swimming pool and complimentary full breakfast. Group rates and special discounts for AAA members are available. A multi-lingual and attentive staff is ready to ensure a comfortable and memorable stay. Make an online reservation today and save at this Clewiston, Florida hotel! Enjoy your stay. From: Miami (South). Go north on Highway 27 to Clewiston. The Best Western of Clewiston is on the west side. From: Sebring (North). 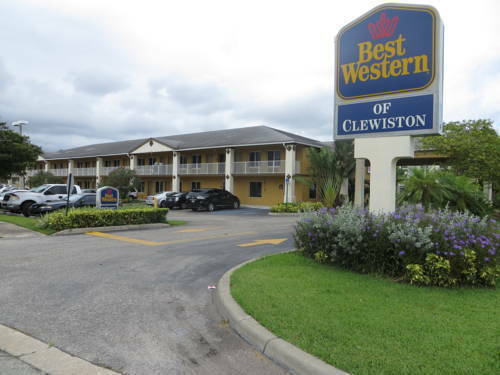 Go south on Highway 27 to Clewiston, the Best Western of Clewiston is on the west side. The people who lived at The Koreshan Unity knew that the Earth is hollow and that we all live inside it. Ground Zero for facts about a mysterious and smelly biped who stalks the Florida Everglades. Opened in April 2018, a seven-story, 800-car parking garage is broken into five sections that are covered with gaudy, strange art from five different architects.